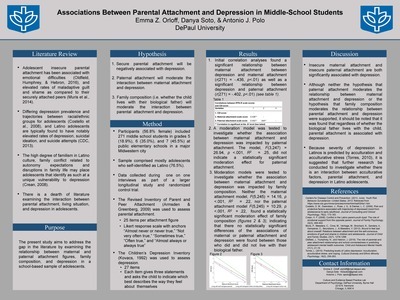 "Associations Between Parental Attachment and Depression in Middle-Scho" by Emma Orloff, Danya Soto et al. Adolescent insecure parental attachment has been associated with emotional difficulties (Oldfield, Humphrey, & Hebron, 2016), and elevated rates of maladaptive guilt and shame as compared to their securely attached peers (Muris et al., 2014). It is important to note the high degree of familism in Latino culture, family conflict related to autonomy expectations and disruptions in family life may place adolescents that identify as such at a unique vulnerability to depression (Crean, 2008). Nevertheless, there is a dearth of literature examining the interaction between parental attachment, living situation, and depression in adolescents, so the present study will examine the relationship between maternal and paternal attachment figures, family composition, and depression in a school-based sample. Participants (56.8% female) included 271 middle school students in grades 5 (18.9%), 6 (35.0%), and 7 (45.5%) at public elementary schools in a major Midwestern city. The sample comprised mostly adolescents who self-identified as Latino (76.5%). Data were collected during one on one interviews as part of a larger longitudinal study and randomized control trial. The Revised Inventory of Parent and Peer Attachment (Armsden & Greenberg, 2009) was used to assess parental attachment, and the Children’s Depression Inventory (Kovacs, 1992) was used to assess depression. Initial correlation analyses found a significant relationship between depression and maternal attachment (r(271) = -.436, p<.01) as well as a significant relationship between depression and paternal attachment (r(271) = -.402, p<.01). Further analyses will be conducted to investigate whether family composition or paternal attachment act as moderators of the relationship between maternal attachment and depression. These findings could help clinicians and school-based providers interested in supporting youth and their families.